Samuel Paul Sauceda, age 89, died peacefully in his home on April 4, 2016. Sauceda was born July 19, 1926 in Elgin, Il. to John and Jessie (nee Valdivia) Sauceda. He is survived by his wife of 55 years, Judith Ann Sauceda (nee Marx), his sons David (Bonnie) Sauceda and James (Lori) Sauceda, his daughters Laura (David) Koziol and Jean Sauceda, his brothers Peter and Arturo Sauceda, as well as his grandchildren Samuel, Alexander and Gabriella Koziol, Malia Sauceda, Joe Cavaluzzi, and Jeimmy and Camilo Sauceda. He is further survived by many nieces, nephews, and other relatives. He was preceded in death by his parents, his brothers Alfredo, John and Adolfo Sauceda, his sister, Ann Peña, his sister-in-law Sharon (Art) Sauceda and his brother-in-law Andres (Ann) Peña. Sauceda, the oldest of six siblings, was a star athlete at Elgin High School and earned all state honors in football and basketball. He was inducted into the Elgin Sports Hall of Fame in 1981. 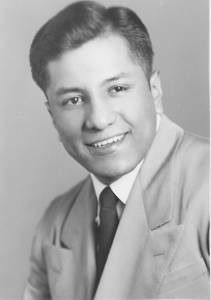 Sauceda was the first Hispanic to earn an athletic scholarship to Marquette University and played the 1944 football season before enlisting in the U.S. Army. He was stationed in Germany at the end of World War II. Upon returning from the war, he played four years of basketball at Marquette University (1947-1950) and an additional year of football in 1948. Sauceda, a six-time letter winner, was one of only four freshmen in Marquette history to letter in both football and basketball. After his senior year, he was the school’s all-time leader in steals and second leading scorer in basketball. Following the 1949-50 season, he represented Marquette in the College Basketball All-Star game at Chicago Stadium. Sauceda served as Marquette’s Athletic Director from 1969-73 and was also Chairman of the Athletic Board. A Spanish professor, Sauceda received his B.A. from Marquette University, a Master Degree of Arts from the University of Wisconsin-Madison (Spanish) and a Doctorate from the University of Madrid (Spanish). He was a faculty member of the Foreign Language Department at Marquette University where he taught for 43 years and retired in 1997. He established the Marquette in Madrid Junior Year Abroad program in 1965 and served as its resident director. He also taught in Guadalajara, Mexico for eight years with the University of San Diego Summer Program. Sauceda cherished being a teacher and was an avid sports fan – proudly one of Marquette University’s biggest supporters. He loved playing golf, being with family, attending summer festivals and cookouts and sitting in the patio shade with his wife Judy during late summer afternoons enjoying cocktails and each other’s company. Services will be held on April 16, 2016 at Old Saint Mary Parish (844 N Broadway, Milwaukee, WI 53202) with a gathering beginning at 9:30 a.m. followed by Mass at 11:00. In lieu of flowers, memorial donations can be made to either Riverwest Food Pantry or Catholic East Elementary.